Now Available: Now with native iPad interface! Version 9.1 with iOS 9 compatibility, Auto-Tuner, PRESETS, popup taal picker, TAP TEMPO, Santoor and more! Check out the YouTube demo or the audio sample below for the fantastic new sound. Note: All updates are always free! ★★★★★ "Wow, lehra in my pocket!" ★★★★★ "Great concept, EXCELLENT execution"
★★★★★ "Fantastic, keep up the good work!" ★★★★★ "Simple yet pretty interface"
When played as a solo instrument, the tabla is accompanied (usually on the harmonium or sarangi) by a continuous cyclical musical phrase or riff called the "Lehra" or “Nagma” (ostinato in western music) that keeps track of the "aavartan" or rythmic cycle in the chosen "taal". iLehra is an electronic Lehra / Nagma player for the iPhone and iPod Touch. It provides accurate as well as pleasing lehra accompaniment for a wide variety of taals and raags on either the harmonium, violin, or the flute. Innovative features include beautiful tanpura auto-tuned to the chosen lehra/raag, presets, tap-tempo, metronome, and extremely intuitive controls. ✓Taals included: Ada Chautaal(14), Basant Taal(9), Chartal-ki-Sawari(11), Chautaal(12), Dadra(6), Deepchandi(14), Dhamar(14), Ektaal(12), Farodust/Firdost(14), Ganesh Taal(21), Jhaptaal(10), Jhoomra(14), Keherva(8), Matta Taal(9), Pancham Sawari(15), Rudra Taal(11), Rupak(7), Sooltaal(10), Teentaal(16), as well as general lehras for 7.5, 8.5, 9.5, 10.5, 13, and 18 beats. ✓Beautiful, realistic lehras on Harmonium, Violin, Flute, or the Santoor! ✓Tap Tempo: just tap the beats on the bottom display and watch iLehra sync up! ✓Presets: save your frequently-used combinations of pitch, taal, lehra, instrument & tempo as named presets. And now you can also export/import presets via email or iTunes File Sharing. ✓Can be used with speakers, headset, or the internal speaker. A high-quality speaker dock is recommended for maximum effect. Top Section: This is common to the lehra and the tanpura and is used to set the "base" pitch of Sa. ➡The display in the middle shows the current note name (i.e. C#) in the center, the octave on the upper right, and the current fine-tune relative value on the upper left. The color of the text in the display indicates whether the fine-tune slider is exactly in the middle (green), to the left of center (red), or to the right of center (cyan). Bottom Section: The bottom section is used to pick the taal, the lehra and the tempo. Presets Tab: The Presets tab lets you load presets, delete existing ones, or save new presets. iLehra ships with a few sample presets, but you can add your own as well as delete the existing ones at any time. 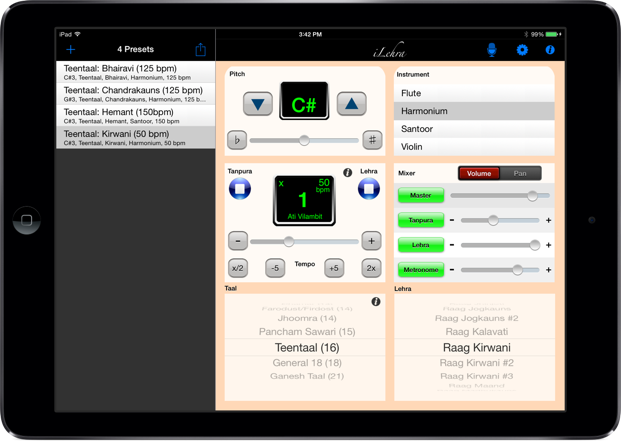 A preset saves the current pitch, the taal, lehra, instrument and the tempo. ➡To delete a preset, simply swipe your finger across the preset row and click on the Delete button, or click on the Action button on the top right and choose Delete Preset(s) to enter delete mode. Click on Done on the top left to exit from the delete mode. ➡To create a new preset, first set the pitch, taal, lehra, instrument and tempo. Then click on the New Preset (+) icon on the top left. Enter a name for the preset when prompted, click OK and you're done! ➡To update a preset, first choose the preset and make sure everything you want to include is playing (important!). Make any changes you need from the main tab, click on the action button on the top right and choose Update Preset. ➡To email a preset, first select the preset, click on the action button on the top right and choose Email Selected Preset. To send the whole list of presets (or simply back them up) choose Email All Presets from the action menu. To import presets received via email, open the email on the device, click on the attachment, and choose Open in iLehra. ➡Choose iLehra in the list of apps, you should now see the iLehraPresets file in the Documents area on the right. Tuner Tab: The Tuner tab lets you tune external instruments to iLehra, or vice-versa. NOTE: This requires an iPhone or an iPod Touch (2nd/3rd gen) with an external microphone connected to it. ➡Or click on the Capture button to auto-tune iLehra to the external instrument - this makes the captured pitch the new "Sa"
Settings Tab: The Settings tab lets you change the application's global settings. ✦Dim Screen: This option disables screen lock and instead dims the screen after a few seconds of inactivity and displays a bigger version of the matra display. Click on the screen again to brighten it. This is the default setting and the recommended option. Info Tab: The info (information) tab provides quick links to iLehra help, more information about the tabla and lehra, and other useful information. iLehra is a universal app - this means you buy it once and it works natively on the iPhone, the iPod Touch as well as the iPad. The iPad version has a similar layout except most of the major controls are accessible on one page. The Tuner, Settings and Info pages can be accessed via the toolbar buttons on the top right. And yes it works great on all iPad models! Click the picture below for a larger view. For best effect, use a high-quality speaker dock with an internal rechargeable battery or any other good pair of external speakers. Special thanks to Rupesh Kotecha for lehras, feedback, beta testing, and lots of encouragement!